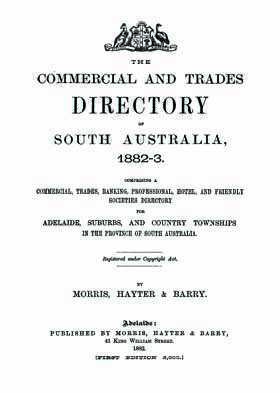 This directory is comprised of a Commercial, Trades, Banking, Professional, Hotel, and Friendly Societies directory for Adelaide, Suburbs and Country Townships in the Province of South Australia. Many advertisements are dispersed throughout, which provide useful information, often including names of people and places. This is a terrific genealogy resource for anyone exploring their South Australian family history or building a family tree.